West Hernando Diagnostic Center's web-based RIS (Radiology Information System) solution provides a powerful software platform to perform day-to-day operations. It is a user-friendly application that provides you real-time access to patient exam images. 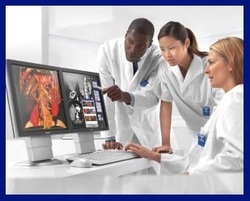 When a patient’s exam is complete, images are transmitted to one of our renowned board-certified specialists. With West Hernando Diagnostic Center’s web-based RIS software you and your staff will have the ability to monitor the status of the patient's exam, view prior reports and images, and conveniently schedule new exams. By viewing images electronically you are able to have real-time consultations with the interpreting physician. In addition, our technology reduces the cost and inconvenience associated with filming, storage and retrieval of hard copy film and paper reports. West Hernando Diagnostic Center’s Information Systems are secure and HIPAA compliant. For more information on this service, please feel free to contact us at (352) 688-5860. To access West Hernando Diagnostic Center's RIS application, click here and you will be directed to the RIS Login.